Market State 12-A (29 Days) Transitional/Bearish: Each Market State has its own unique characteristics. Transitional States tend to have frequent large daily swings in value. These “big moves” often appear to be random and are counter intuitive. 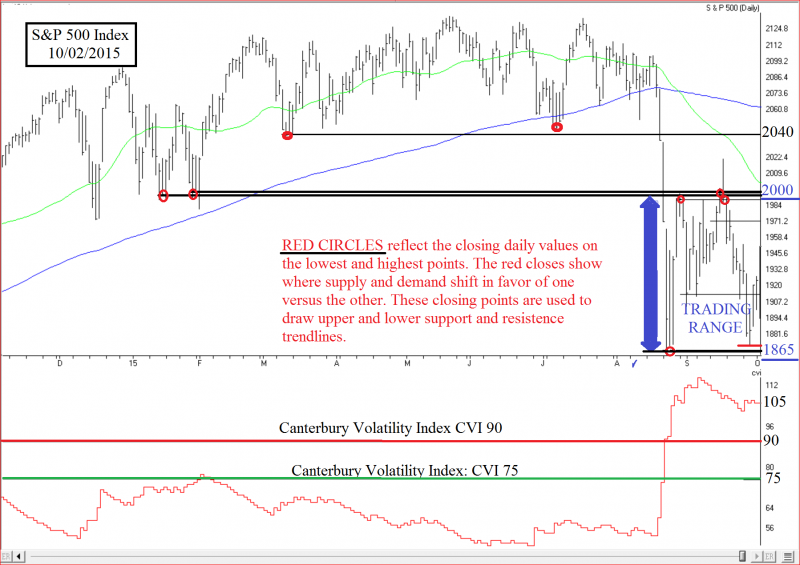 Canterbury Volatility Index (CVI 105) Bearish/Unstable: Canterbury’s evidence based studies show a pattern connecting a volatility reading above CVI 90 with negative current and future market environments. Overbought/Oversold indicator (46% Oversold) Neutral: The Overbought/Oversold indicator is used to make small tactical adjustments during Transitional - Market States. A reading of 95% Oversold or higher will trigger a slight increase in our long equity holdings and a 95% or higher Overbought will call for a slight decrease in the percentage of global equity ETF holdings. Last week the S&P 500 was up 20 points, or 1.0%, ending at 1,951. The Dow also finished the week up 1.0%. Sounds a bit boring. Actually, it was anything but boring. For example, Friday had an intraday trading range of 3%, closing on its high for the day. If Friday would have closed on its low, instead of its high, the week would have been down -2% instead of up 1%. The S&P 500 began the week with a sharp decline of 3% and revisited the August 25th cycle low at 1872. The S&P 500 is currently in a 7% plus trading range between 2000 and 1865. The daily swings are substantially higher than normal. The chart below highlights the recent trading range. It is important to note that the price fluctuations, within the designated range, are of little irrelevance. They are reflective of the typical market noise associated with Transitional Market environments. The overall market is worse than the S&P 500 would suggest. In fact, the equal weighted S&P 500, Russell 2000 index, and several others broke below their August 24th lows. The advance decline line (number of stocks going up verses down) on the S&P 500 and NASDAQ have continued to deteriorate. We remain in a bearish market environment. Keep in mind that bear markets are known for having substantial rallies followed by additional declines that test, and many times break, the old lows. Volatile markets are counter intuitive. Transitional/Bearish - Market States begin and end quickly, when most investors would least expect. Risk management is paramount to maintaining portfolio stability. 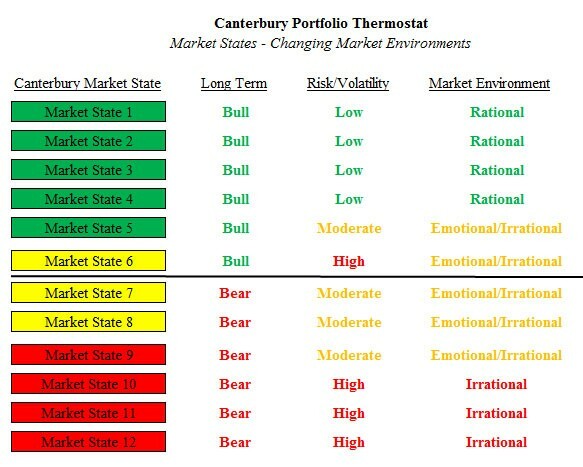 The Portfolio Thermostat focuses on long term compounded returns. This is accomplished through systematic and timely adjustments of ETF holdings to match (and benefit from) the prevailing market environment. Some of the largest gains occur during the sharp advances that often follow Transitional and Bear Market States.